Join master teacher Aadil Palkhivala for a comprehensive course on stress relief. Learn specific stress triggers to avoid, habits to cultivate for relaxation, and how to relieve tension in your back, neck, hips, wrists, and other areas of the body commonly burdened by stress. After you’ve completed this course, you will have the tools to choose a happier and healthier state of being! How the body responds to stress—both physiologically and neurologically. A framework for living a life with less stress. Mantra practices to help you find more calmness and peace. Guided pranayama (breathwork) to relieve tension. Mental centering, body scans, and guided visualization for releasing toxic emotions. Stress-reducing activities you can do everyday for a healthier lifestyle. 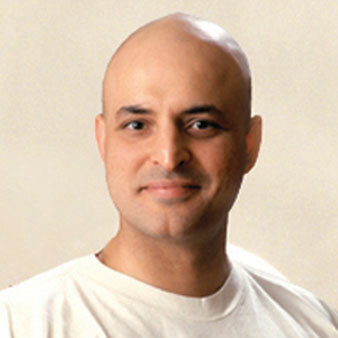 Aadil Palkhivala is one of the foremost yoga teachers in the world. He began his asana studies with B.K.S. Iyengar at the age of 7 and received an Advanced Iyengar Teacher's Certificate at 22! He is the author of the book Fire of Love and devoted to Sri Aurobindo's Purna Yoga. Aadil is co-Director of the Alive and Shine Center in Bellevue, Washington and The College of Purna Yoga, an internationally acclaimed, advanced teacher training program. He was a certified Shiatsu and Swedish therapist, and a Clinical Hypnotherapist. Aadil has studied holistic healing and Ayurveda extensively. He holds degrees in law, physics and mathematics, and co-hosted the Alive and Shine Radio Show with his wife, Savitri. Fulfilling 4 of these study hours is as easy as logging into the Yoga Alliance website and entering your hours after you’ve completed Yoga for Stress Relief. Continue your yoga education with this course and more from the Yoga International library!